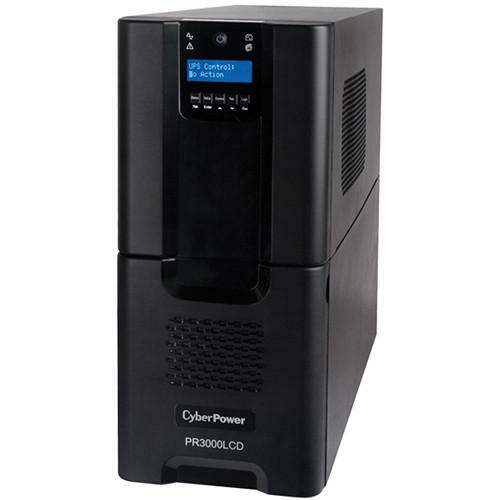 We recommend checking out our discussion threads on the CyberPower Smart App Sinewave PR3000LCD UPS PR3000LCD, which address similar problems with connecting and setting up UPS Backup CyberPower. The user manual for the CyberPower Smart App Sinewave PR3000LCD UPS PR3000LCD provides necessary instructions for the proper use of the product Computers & Solutions - Power - UPS Backup. The Smart App Sinewave PR3000LCD UPS from CyberPower provides backup power essential to keeping your electronics powered should that power be interrupted. This power supply comes equipped with pure sine wave technology ensuring a constant flow of high quality clean power, while the full automatic voltage regulation feature adjusts the voltage keeping it within a safe operating range to reduce the risk of damage to connected devices. Along with enhanced voltage protection, you can monitor the UPS via the integrated LCD control panel complete with a 4.5' extension cable providing easy access when the UPS is located in hard to reach areas. Once configured, your connected devices are protected up to $375,000 should any of those devices become damaged due to failure of the UPS. If you own a CyberPower ups backup and have a user manual in electronic form, you can upload it to this website using the link on the right side of the screen. Box Dimensions (LxWxH) 25.8 x 22.0 x 13.0"
The user manual for the CyberPower Smart App Sinewave PR3000LCD UPS PR3000LCD can be downloaded in .pdf format if it did not come with your new ups backup, although the seller is required to supply one. It is also quite common that customers throw out the user manual with the box, or put the CD away somewhere and then can’t find it. That’s why we and other CyberPower users keep a unique electronic library for CyberPower ups backups, where you can use our link to download the user manual for the CyberPower Smart App Sinewave PR3000LCD UPS PR3000LCD. The user manual lists all of the functions of the CyberPower Smart App Sinewave PR3000LCD UPS PR3000LCD, all the basic and advanced features and tells you how to use the ups backup. The manual also provides troubleshooting for common problems. Even greater detail is provided by the service manual, which is not typically shipped with the product, but which can often be downloaded from CyberPower service. If you want to help expand our database, you can upload a link to this website to download a user manual or service manual, ideally in .pdf format. These pages are created by you – users of the CyberPower Smart App Sinewave PR3000LCD UPS PR3000LCD. User manuals are also available on the CyberPower website under Computers & Solutions - Power - UPS Backup.